All 2018 Flag Officer announcements for the U.S. Navy. Flag Officers have reached the rank of Admiral, Vice Admiral, Rear Admiral, and Rear Admiral Lower Half and have a pay grade of O-7 and above. Navy Vice Adm. James J. Malloy for reappointment to the rank of vice admiral, and assignment as commander, U.S. Naval Forces, Central Command; commander, Fifth Fleet; and commander, Combined Maritime Forces, in Bahrain. Malloy is currently serving as deputy chief of naval operations for operations, plans, and strategy, N3/N5, Office of the Chief of Naval Operations, Pentagon, Washington, District of Columbia. Navy Vice Adm. Andrew L. Lewis for reappointment to the rank of vice admiral and assignment as commander, Second Fleet; and commander, Joint Forces Command Norfolk. Lewis is currently serving as commander, Second Fleet, Norfolk, Virginia. Navy Capt. Robert D. Katz for appointment to the rank of rear admiral (lower half). Katz most recently served as Program and Budget Analysis Division chief, Joint Staff, Washington, District of Columbia. Navy Vice Adm. Andrew L. Lewis for reappointment to the rank of vice admiral, and assignment as commander, Second Fleet, Norfolk, Virginia. Lewis is currently serving as deputy chief of naval operations for Operations, Plans, and Strategy, N3/N5, Office of the Chief of Naval Operations, Pentagon, Washington, District of Columbia. 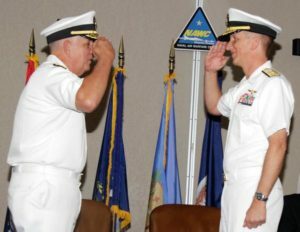 Navy Rear Adm. Michael J. Dumont for appointment to the rank of vice admiral, and assignment as deputy commander, U.S. Northern Command; and vice commander, U.S. Element, North American Aerospace Defense Command, Peterson Air Force Base, Colorado. Dumont is currently serving as vice director, Joint Staff, Pentagon, Washington, District of Columbia. Navy Rear Adm. John G. Hannink for appointment to the rank of vice admiral, and assignment as judge advocate general of the Navy, Pentagon, Washington, District of Columbia. Hannink is currently serving as deputy judge advocate general of the Navy; and commander, Naval Legal Service Command, Washington, District of Columbia. Navy Rear Adm. James J. Malloy for appointment to the rank of vice admiral, and assignment as deputy chief of naval operations for Operations, Plans, and Strategy, N3/N5, Office of the Chief of Naval Operations, Pentagon, Washington, District of Columbia. Malloy is currently serving as vice director for Operations, J3, Joint Staff, Pentagon, Washington, District of Columbia. Navy Vice Adm. Michael M. Gilday for reappointment to the rank of vice admiral and assignment as director for operations, J-3, Joint Staff, Pentagon, Washington, District of Columbia. Gilday is currently serving as commander, Fleet Cyber Command/commander, Tenth Fleet, Fort Meade, Maryland. Navy Captain William P. Pennington for appointment to the rank of rear admiral (lower half). Pennington is currently serving as chief of staff, Naval Air Force, United States Atlantic Fleet, Norfolk, Virginia. Navy Rear Adm. (lower half) Marcus A. Hitchcock for appointment to the rank of rear admiral. Hitchcock is currently serving as commander, Navy Warfare Development Command, Norfolk, Virginia. Navy Capt. Christopher C. French for appointment to the rank of rear admiral (lower half), and assignment as the legal counsel to the chairman of the Joint Chiefs of Staff. French is currently serving as staff judge advocate, U.S. European Command. Navy Capt. Jeffrey S. Scheidt for appointment to the rank of rear admiral (lower half). Scheidt is currently serving as executive assistant to the deputy chief of naval operations for information warfare, N2N6, Office of the Chief of Naval Operations, Washington, District of Columbia. Navy Vice Adm. Michael M. Gilday for reappointment to the rank of vice admiral, and assignment as director for operations, J-3, Joint Staff, Pentagon, Washington, District of Columbia. Gilday is currently serving as commander, Fleet Cyber Command; and commander, Tenth Fleet, Fort Meade, Maryland. Navy Rear Adm. Craig S. Faller for appointment to the rank of vice admiral while serving as senior military assistant to the secretary of defense. Navy Adm. Philip S. Davidson for reappointment to the rank of admiral, and assignment as commander, U.S. Pacific Command, Honolulu, Hawaii. Davidson is currently serving as commander, U.S. Fleet Forces Command, Norfolk, Virginia. Navy Rear Adm. David M. Kriete for appointment to the rank of vice admiral, and assignment as deputy commander, U.S. Strategic Command, Offutt Air Force Base, Nebraska. Kriete most recently served as director, Strategic Capabilities Policy, National Security Council, Washington, District of Columbia. Navy Rear Adm. (lower half) Ronny L. Jackson for appointment to the rank of rear admiral. Jackson is currently serving as attending physician to the president; and deputy assistant to the president, Washington, District of Columbia. Navy Rear Adm. (lower half) Brent W. Scott, Chaplain Corps, for appointment as chief of chaplains. Scott is currently serving as chaplain of the Marine Corps; deputy chief of chaplains and deputy director of Religious Ministries, N097B, Office of the Chief of Naval Operations, Pentagon, Washington, District of Columbia. Navy Reserve Rear Adm. (lower half) Alan D. Beal has been nominated for appointment to the rank of rear admiral. Beal is currently serving as reserve deputy commander, U.S. Naval Forces, U.S. Central Command, U.S. Fifth Fleet, Manama, Bahrain. Navy Rear Adm. (lower half) Eugene H. Black III has been nominated for appointment to the rank of rear admiral. Black is currently serving as commander, Carrier Strike Group Eight, Norfolk, Virginia. Navy Rear Adm. (lower half) William D. Byrne Jr., has been nominated for appointment to the rank of rear admiral. Byrne is currently serving as commander, Carrier Strike Group Fifteen, San Diego, California. Navy Rear Adm. (lower half) Marc H. Dalton has been nominated for appointment to the rank of rear admiral. Dalton is currently serving as commander, Task Force Seven Zero; and commander, Carrier Strike Group Five, Yokosuka, Japan. Navy Rear Adm. (lower half) John V. Fuller has been nominated for appointment to the rank of rear admiral. Fuller is currently serving as commander, Carrier Strike Group One, San Diego, California. Navy Rear Adm. (lower half) Michael P. Holland has been nominated for appointment to the rank of rear admiral. Holland is currently serving as commander, Submarine Group Ten, Kings Bay, Georgia. Navy Rear Adm. (lower half) Hugh W. Howard III has been nominated for appointment to the rank of rear admiral. Howard is currently serving as assistant commander, Joint Special Operations Command, U.S. Special Operations Command, Fort Bragg, North Carolina. Navy Rear Adm. (lower half) Jeffrey W. Hughes has been nominated for appointment to the rank of rear admiral. Hughes is currently serving as commander, Navy Personnel Command; and deputy chief of Naval Personnel, Millington, Tennessee. Navy Reserve Rear Adm. (lower half) Brian S. Hurley has been nominated for appointment to the rank of rear admiral. Hurley is currently serving as reserve deputy commander for Maritime Operations, U.S. Fleet Forces Command, Norfolk, Virginia. Navy Rear Adm. (lower half) Thomas E. Ishee has been nominated for appointment to the rank of rear admiral. Ishee is currently serving as director, plans and operations, U.S. Naval Forces Europe – Sixth Fleet; deputy commander, Sixth Fleet; commander, Submarines, Allied Naval Forces South; and commander, Submarine Group Eight, Naples, Italy. Navy Rear Adm. (lower half) Roy I. Kitchener has been nominated for appointment to the rank of rear admiral. Kitchener is currently serving as deputy, U.S. Military Representative to NATO Military Committee, Brussels, Belgium. Navy Rear Adm. (lower half) Stephen T. Koehler has been nominated for appointment to the rank of rear admiral. Koehler is currently serving as commander, Carrier Strike Group Nine, San Diego, California. Navy Reserve Rear Adm. (lower half) Andrew C. Lennon has been nominated for appointment to the rank of rear admiral. Lennon is currently serving as deputy chief of staff, Submarines, NATO Maritime Command, Northwood, United Kingdom. Navy Rear Adm. (lower half) Samuel J. Paparo Jr., has been nominated for appointment to the rank of rear admiral. Paparo most recently served as commander, Carrier Strike Group Ten, Norfolk, Virginia. Navy Reserve Rear Adm. (lower half) Mary C. Riggs has been nominated for appointment to the rank of rear admiral. Riggs is currently serving as director, research and development, Defense Health Agency, Falls Church, Virginia. Navy Rear Adm. (lower half) Michelle C. Skubic has been nominated for appointment to the rank of rear admiral. Skubic is currently serving as commander, Defense Logistics Agency – Land and Maritime, Columbus, Ohio. Navy Rear Adm. (lower half) Jeffrey E. Trussler has been nominated for appointment to the rank of rear admiral. Trussler is currently serving as director, future plans, N3/N5, Office of the Chief of Naval Operations, Washington, District of Columbia. Navy Rear Adm. (lower half) William W. Wheeler III has been nominated for appointment to the rank of rear admiral. Wheeler is currently serving as commander, Patrol and Reconnaissance Group, Norfolk, Virginia. Navy Rear Adm. (lower half) Kenneth R. Whitesell has been nominated for appointment to the rank of rear admiral. Whitesell is currently serving as commander, Carrier Strike Group Four, Norfolk, Virginia. Navy Rear Adm. Scott A. Stearney for appointment to the rank of vice admiral, and assignment as commander, U.S. Naval Forces, Central Command; commander, Fifth Fleet; and commander, Combined Maritime Forces, Bahrain. Stearney is currently serving as director, J3, U.S. Central Command, MacDill Air Force Base, Florida. Navy Rear Adm. (lower half) Ronald C. Copley has been nominated for appointment to the rank of rear admiral. Copley is currently serving as director of intelligence, J2, U.S. Strategic Command, Offutt Air Force Base, Nebraska. Navy Rear Adm. (lower half) Brian K. Corey has been nominated for appointment to the rank of rear admiral. Corey is currently serving as commander, Naval Air Warfare Center, Weapons Division; and assistant commander for test and evaluation, Naval Air Systems Command (AIR-5.0), China Lake, California. Navy Rear Adm. (lower half) Darse E. Crandall has been nominated for appointment to the rank of rear admiral. Crandall is currently serving as legal counsel to the Chairman of the Joint Chiefs of Staff, Washington, District of Columbia. Navy Rear Adm. (lower half) Kathleen M. Creighton has been nominated for appointment to the rank of rear admiral. Creighton is currently serving as deputy commander, Joint Forces Headquarters-Department of Defense Information Networks, Defense Information Systems Agency, Fort Meade, Maryland. Navy Rear Adm. (lower half) John W. Korka has been nominated for appointment to the rank of rear admiral. Korka is currently serving as commander, Naval Facilities Engineering Command, Pacific; and director, Fleet Civil Engineer, U.S. Pacific Fleet, Pearl Harbor, Hawaii. engineering, SEA-05, Naval Sea Systems Command, Washington, District of Columbia. Navy Rear Adm. (lower half) Johnny R. Wolfe Jr., has been nominated for appointment to the rank of rear admiral. Wolfe is currently serving as program executive, Aegis Ballistic Missile Defense, Missile Defense Agency, Dahlgren, Virginia. Navy Capt. John J. Adametz has been nominated for appointment to the rank of rear admiral (lower half). Adametz is currently serving as commanding officer, Naval Facilities Engineering and Expeditionary Warfare Center, Port Hueneme, California. Navy Capt. James A. Aiken has been nominated for appointment to the rank of rear admiral (lower half). Aiken is currently serving as executive assistant, Assistant Secretary of the Navy (Financial Management and Comptroller), Washington, District of Columbia. Navy Capt. Thomas J. Anderson has been nominated for appointment to the rank of rear admiral (lower half). Anderson is currently serving as executive assistant, Naval Sea Systems Command, Washington Navy Yard, District of Columbia. Navy Capt. Heidi K. Berg has been nominated for appointment to the rank of rear admiral (lower half). Berg is currently serving as special assistant to the Director of Digital Warfare Office, N2N6, Office of the Chief of Naval Operations, Washington, District of Columbia. Navy Capt. Michael A. Brookes has been nominated for appointment to the rank of rear admiral (lower half). Brookes is currently serving as information warfare commander, Carrier Strike Group One, San Diego, California. Navy Capt. William E. Chase III has been nominated for appointment to the rank of rear admiral (lower half). Chase is currently serving as chief of staff, Naval Information Forces, Suffolk, Virginia. Navy Capt. Richard J. Cheeseman Jr., been nominated for appointment to the rank of rear admiral (lower half). Cheeseman is currently serving as director, Surface Warfare Officer Distribution, PERS-41, Navy Personnel Command, Millington, Tennessee. Navy Capt. Craig A. Clapperton has been nominated for appointment to the rank of rear admiral (lower half). Clapperton is currently serving as special assistant to commander, Naval Air Forces, U.S. Pacific Fleet, North Island, California. Navy Capt. Keith B. Davids has been nominated for appointment to the rank of rear admiral (lower half). Davids is currently serving as special assistant to the president; and deputy director, White House Military Office, Washington, District of Columbia. Navy Capt. Joseph A. J. Diguardo has been nominated for appointment to the rank of rear admiral (lower half). Diguardo is currently serving as assistant vice deputy director, J39, Joint Staff, Washington, District of Columbia. Navy Capt. Leonard C. Dollaga has been nominated for appointment to the rank of rear admiral (lower half). Dollaga is currently serving as director, Navy Budget Office and Congressional Appropriations Committee, Assistant Secretary of the Navy (Financial Management and Comptroller), Washington, District of Columbia. Navy Reserve Capt. Ann H. Duff has been nominated for appointment to the rank of rear admiral (lower half). Duff is currently serving as commanding officer, Naval Reserve, U.S. Fleet Forces Personnel Management Command, Norfolk, Virginia. Navy Capt. Kristen B. Fabry has been nominated for appointment to the rank of rear admiral (lower half). Fabry is currently serving as director, Fleet Resources Integration, U.S. Fleet Forces Command, Norfolk, Virginia. Navy Capt. Christopher S. Gray has been nominated for appointment to the rank of rear admiral (lower half). Gray is currently serving as chief of staff, Navy Installations Command, Washington, District of Columbia. Navy Capt. John E. Gumbleton has been nominated for appointment to the rank of rear admiral (lower half). Gumbleton is currently serving as director, Operations Division, Office of Budget, Assistant Secretary of the Navy (Financial Management and Comptroller), Washington, District of Columbia. Navy Capt. James A. Kirk has been nominated for appointment to the rank of rear admiral (lower half). Kirk is currently serving as deputy, weapons and sensors, N96, Office of the Chief of Naval Operations, Washington, District of Columbia. Navy Capt. Timothy J. Kott has been nominated for appointment to the rank of rear admiral (lower half). Kott is currently serving as branch head, programming and development, N801, Office of the Chief of Naval Operations, Washington, District of Columbia. Navy Reserve Capt. Nancy S. Lacore has been nominated for appointment to the rank of rear admiral (lower half). Lacore is currently serving as commanding officer, Camp Lemonnier, Djibouti, Africa. Navy Reserve Capt. Eileen H. Laubacher has been nominated for appointment to the rank of rear admiral (lower half). Laubacher is currently serving as regional commander, Naval Information Force Reserve Region Washington, Washington, District of Columbia. Navy Reserve Capt. Theodore P. Leclair has been nominated for appointment to the rank of rear admiral (lower half). Leclair is currently serving as commanding officer, Navy Reserve Commander, U.S. Seventh Fleet, Fort Worth, Texas. Navy Capt. John S. Lemmon has been nominated for appointment to the rank of rear admiral (lower half). Lemmon is currently serving as vice commander, Naval Air Systems Command, Patuxent River, Maryland. Navy Capt. Fredrick R. Luchtman has been nominated for appointment to the rank of rear admiral (lower half). Luchtman is currently serving as executive assistant, U.S. Pacific Fleet, Pearl Harbor, Hawaii. Navy Capt. Brendan R. McLane has been nominated for appointment to the rank of rear admiral (lower half). McLane is currently serving as chief of staff, Naval Surface Force, U.S. Pacific Fleet, San Diego, California. Navy Reserve Capt. Mark J. Mouriski has been nominated for appointment to the rank of rear admiral (lower half). Mouriski is currently serving as chief of staff, Naval Air Reserve Program Executive Office, Naval Air Systems Command, Patuxent River, Maryland. Navy Capt. Joseph D. Noble Jr., has been nominated for appointment to the rank of rear admiral (lower half). Noble is currently serving as commanding officer, Naval Supply Corps School, Newport, Rhode Island. Navy Capt. Scott W. Pappano has been nominated for appointment to the rank of rear admiral (lower half). Pappano is currently serving as major program manager, PMS 392, Naval Sea Systems Command, Washington, District of Columbia. Navy Reserve Capt. Eric C. Ruttenberg has been nominated for appointment to the rank of rear admiral (lower half). Ruttenberg is currently serving as commanding officer, Space and Naval Warfare Systems Reserve Program, San Diego, California. Navy Capt. Ryan B. Scholl has been nominated for appointment to the rank of rear admiral (lower half). Scholl is currently serving as chief of staff, Naval Air Force Atlantic, Norfolk, Virginia. Navy Capt. Lance G. Scott has been nominated for appointment to the rank of rear admiral (lower half). Scott is currently serving as executive assistant, U.S. Pacific Command, Camp H. M. Smith, Hawaii. Navy Capt. Philip E. Sobeck has been nominated for appointment to the rank of rear admiral (lower half). Sobeck is currently serving as special assistant to the director of Digital Warfare Office, N2N6, Office of the Chief of Naval Operations, Washington, District of Columbia. Navy Capt. John D. Spencer has been nominated for appointment to the rank of rear admiral (lower half). Spencer is currently serving as executive assistant, U.S. Strategic Command, Omaha, Nebraska. Navy Capt. Gregory N. Todd has been nominated for appointment to the rank of rear admiral (lower half). Todd is currently serving as chaplain, U.S. Coast Guard, Washington, District of Columbia. Navy Capt. Douglas C. Verissimo has been nominated for appointment to the rank of rear admiral (lower half). Verissimo is currently serving as commanding officer, USS Carl Vinson (CVN 70), San Diego, California. Navy Capt. George M. Wikoff has been nominated for appointment to the rank of rear admiral (lower half). Wikoff is currently serving as executive assistant to the chief of naval operations, Office of the Chief of Naval Operations, Washington, District of Columbia. Navy Vice Adm. Christopher W. Grady for appointment to the rank of admiral, and for assignment as commander, U.S. Fleet Forces Command, Norfolk, Virginia. Grady is currently serving as commander, Sixth Fleet; commander, Task Force Six; commander, Striking and Support Forces NATO; deputy commander, U.S. Naval Forces Europe; deputy commander, U.S. Naval Forces Africa; and Joint Force Maritime Component commander Europe, Naples Italy. Navy Vice Adm. Charles A. Richard for reappointment to the rank of vice admiral, and for assignment as commander, Naval Submarine Forces; commander, Submarine Force, U.S. Atlantic Fleet; and commander, Allied Submarine Command, Norfolk, Virginia. Richard is currently serving as deputy commander, U.S. Strategic Command, Offutt Air Force Base, Nebraska. Navy Rear Adm. Michael T. Moran for appointment to the rank of vice admiral, and for assignment as principal military deputy assistant secretary of the Navy (research, development, and acquisition), Pentagon, Washington, District of Columbia. Moran is currently serving as program executive officer for Tactical Aircraft Programs, Patuxent River, Maryland. Navy Rear Adm. Timothy J. White for appointment to the rank of vice admiral, and for assignment as commander, Fleet Cyber Command; and commander, U.S. Tenth Fleet, Fort Meade, Maryland. White is currently serving as commander, cyber, National Mission Force, U.S. Cyber Command, Fort Meade, Maryland. Navy Capt. David A. Welch has been nominated for appointment to the rank of rear admiral (lower half). Welch is currently serving as director for international engagement, N52, Office of the Chief of Naval Operations, Washington, District of Columbia. Vice Adm. John C. Aquilino for appointment to the rank of admiral, and assignment as commander, U.S. Pacific Fleet, Pearl Harbor, Hawaii. Aquilino is currently serving as commander, U.S. Naval Forces, Central Command; and commander, Fifth Fleet/commander, Combined Maritime Forces, Bahrain. Navy Rear Adm. Brian B. Brown for appointment to the rank of vice admiral, and for assignment as commander, Naval Information Forces, Suffolk, Virginia. Brown is currently serving as director, Warfare Integration Directorate, N2/N6F, Office of the Chief of Naval Operations, Pentagon, Washington, District of Columbia. Navy Rear Adm. Gordon D. Peters for appointment to the rank of vice admiral, and for assignment as commander, Naval Air Systems Command, Patuxent River, Maryland. Peters is currently serving as program executive officer, Air Anti-Submarine Warfare, Assault and Special Mission Programs, Patuxent River, Maryland. Navy Rear Adm. Richard P. Snyder for appointment to the rank of vice admiral, and for assignment as inspector general, Department of the Navy, Washington Navy Yard, District of Columbia. Snyder is currently serving as director, J5, U.S. Northern Command, Peterson Air Force Base, Colorado. Vice Adm. Matthew J. Kohler for reappointment to the grade of vice admiral and assignment as deputy chief of naval operations for information warfare, N2/N6, Office of the Chief of Naval Operations; and director of naval intelligence, Pentagon, Washington, District of Columbia. Kohler is currently serving as commander, Naval Information Forces, Suffolk, Virginia. Rear Adm. (lower half) Scott D. Conn has been nominated for appointment to the rank of rear admiral. Conn is currently serving as director, Air Warfare Division, N98, Office of the Chief of Naval Operations, Washington, District of Columbia. Rear Adm. (lower half) Johnny R. Wolfe Jr. for appointment to the grade of vice admiral and assignment as director for strategic systems programs, Washington Navy Yard, District of Columbia. Wolfe is currently serving as program executive, Aegis Ballistic Missile Defense, Missile Defense Agency, Dahlgren, Virginia. Capt. John C. Ring has been nominated for appointment to the rank of rear admiral (lower half). Ring is currently serving as executive assistant, Air Warfare Division, N98, Office of the Chief of Naval Operations, Washington, District of Columbia.